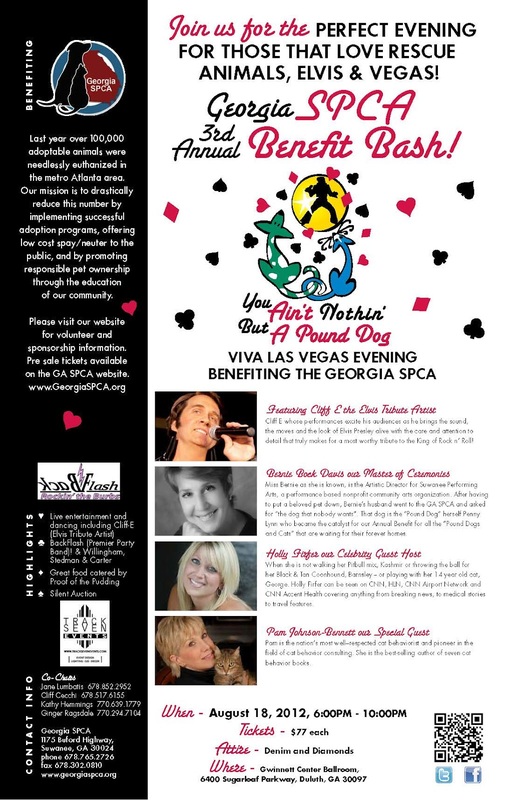 Georgia SPCA 3rd Annual Benefit Bash! Viva Las Vegas! "You Ain't Nothin' But A Pound Dog"
Did you know that the ‘Pound Dog’ event the Georgia SPCA held every year, helps us rescue animals (like Keller above) from Animal Control? Animals that have a lot of medical needs are put down all the time, but thanks to all our Members, Volunteers and staff we are able to bring in donations to cover the medical issues and place then into a “Fur-Ever” home. We placed over 1,000 animals last year with your help and we are needing your donations to reach that again this year. Join us for a fabulous evening benefiting the Georgia SPCA! Great food, casino games, a silent auction, live entertainment featuring Cliff-E (Elvis Tribute Artist), BackFlash Premier Party Band, and Willingham, Stedman and Carter. When you buy your tickets on line go to the comment section and put ‘tumblr’ as to where you read about getting your ticket. We would like to know how you saw to get your ticket(s). Dress code: Denim and Diamonds!!! Oh the fun we'll have! Look at these fabulous silent auction items awaiting you at the Pound Dog benefit bash! A trip to Cancun, Mexico including lodging and airfare, an Atlanta Braves suite for 20 people, plus parking passes, 4 Park Hopper passes to any Walt Disney World theme park; 2 tickets to Carrie Underwood's concert at the Gwinnett Arena, a foursome of golf at the River Club or Sugar Loaf Golf and County Club, and much much more! Everyone who purchases a ticket for the benefit will be eligible to win a 4-day/3-night stay at the Flamingo hotel or Harrah's Resort in Las Vegas NV, plus airfare for two on Southwest Airlines ($800 value) ; people who purchase their tickets online through July 31 will receive TWO chances to win!Or you can bring 5 gallons of bleach or 20 lbs of scoopable cat litter to the shelter and receive $15 off the purchase of a ticket - ($62 instead of $77). The fine print...you must be at least 21 years old to be eligible to win the trip. For more information, visit Georgia SPCA.org. The Georgia SPCA is a no-kill rescue shelter on Buford Highway in Suwanee, GA. To volunteer, donate, or adopt, stop by any day of the week.